﻿ Drywood Termite fumigation using Vikane pest control treatment. 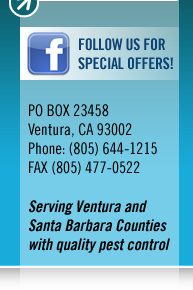 House tenting from Shoreline Pest Control in Ventura and Santa Barbara counties. We use structural fumigation with "Vikane®". Vikane is a time tested proven method of control. With termite tenting, people, pets and interior plants will need to be out of the structure for two nights. As a precaution food items should be placed in special bags that we provide or removed entirely. You value your property and only whole‑structure fumigation with Vikane® gas fumigant ensures elimination of destructive drywood termites from a structure. The No. 1 whole‑structure drywood termite treatment, Vikane has been trusted for nearly half a century in the treatment of more than 2 million structures. It's the best option for total‑home drywood termite protection. Mostly found in warm coastal regions, especially California, Florida, Texas and Hawaii. Colonies live in areas inaccessible to people, in the sound, dry wood of your home – such as in the roof and eaves, and deep inside walls, attics and crawlspaces. Require no external source of moisture or contact with the soil to survive. Can infest any type of home – new or old, wood-framed or concrete. Learn more about Vikane® from Dow's website.